Here's a creative baby shower game that will add some fun to your celebration plus give Mom a cache of useful and personalized bibs for the baby! Everytime she pulls one out she'll think of the great baby shower that was given to her. This works best for a smaller shower so that you can set up the supplies to have each guest create a very special bib for the new baby! Here are our twins wearing their bibs 8 months later, a special creation from their Aunt Jessie (aka TIA J)! 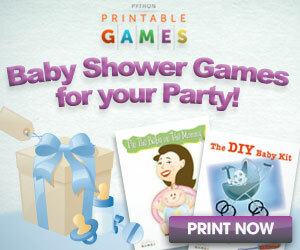 Here's how to organize this cute and creative game for your baby shower. Purchase packages of terry cloth bibs. Find ones that are low pile and soft like these Multi-Color Solid Knit Terry Feeder Bibs Wash them first! Now purchase fabric paints and markers in an assortment of colors. You can also find cute iron on appliques, fun stencils with lettering and designs. These are all easily available at craft stores. Get a nice variety of supplies to make it may possible for the guests to theme their bibs. In our daughter's case some of the guests made bibs representing Mom and Dad's favorite teams. So her twin baby boys had Detroit "Lions" and Maize and Blue University of Michigan themed bibs! For the more artistically challenged add some cute iron on patches like the ones above. Wouldn't it be fun to make bibs for all the holidays using the iron patches. Amazon has them all! Just search iron on patches/babies. After you purchase all the supplies you are ready to go. You could also do this baby shower activity with onsies. Just remember to wash them first before decorating them! Keep in mind that this craft works best for a small shower. You can't be using this fun idea if you are inviting 40 people to the shower. After a fun half hour of bib designing, the hostess displayed the finished projects and in a big bowl, each guest voted on their favorite creation. One rule - no voting for your own design! The winner received a gift card and the Mom to be got all the bibs!! For my daughter, her college girlfriends planned a small intimate shower with 15 guests and did a Sunday afternoon brunch. Here are some fun baby shower menu ideas that are perfect for brunch! We used them for a bridal shower, but they will work for either celebration. This bib-making craft was a fun addition as a baby shower game for their gathering. Another fun addition to a baby shower is a Diaper Cake. Learn how to make one and see some creative examples from our Celebration Ideas Online community. More fun and creative baby shower ideas here! Check out our Baby Shower cupcakes display, it is so easy and absolutely adorable!